Leprosy is a chronic infectious disease caused by the bacteria Mycobacterium leprae, an acid-fast, rod-shaped bacillus. Leprosy mainly affects the skin, peripheral nerves, eyes, mucosa of the upper respiratory tract and other structures. Depending on the bacillary load, the disease can be classified as either paucibacillary or multibacillary. M. leprae multiplies very slowly and the incubation period of the disease varies from 9 months to 20 years, with an average of about five years. Leprosy is not highly infectious. It is transmitted via droplets from the nose and mouth, during close and frequent contacts with untreated cases. Leprosy is curable and treatment provided in the early stages considerably reduces the chances of disability. Today, the diagnosis and treatment of leprosy is easy and most endemic countries are striving to fully integrate leprosy services into existing general health services. This is especially important for those under-served and marginalized communities most at risk from leprosy, often the poorest of the poor. Leprosy is a chronic infectious disease that is caused by a type of bacteria called Mycobacterium leprae (M. leprae). It commonly causes severe nerve damage and disfiguring pale-coloured skin sores on the arms and legs. Nerve damage can affect the eyes, lead to muscle weakness and a loss of feeling in the arms and legs. You can only acquire leprosy if you come in close contact with someone with untreated leprosy and children are at the greatest risk. Leprosy often develops after many years and possibly even decades of the initial exposure to the leprosy-causing bacteria. Treatment is specific to the type of leprosy and severity of the condition. Tuberculoid leprosy is a mild, less severe and less contagious form of leprosy. Lepromatous leprosy is more severe and is characterised by widespread skin bumps, rashes, numbness and weak muscles. In Africa, leprosy prevalence rates have dropped from 57 516 cases in 2000 to 33 690 in 2010, this represents a 42% decrease. 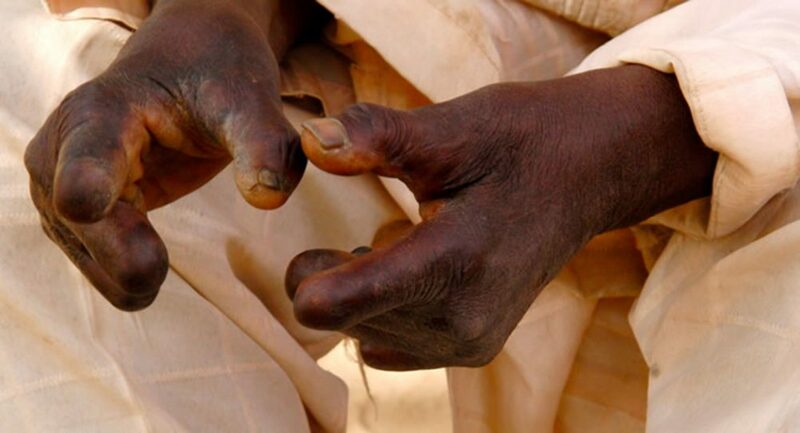 A leprosy-induced irreversible disability currently affects about one million people in Africa. The most vulnerable and high-risk populations are living in poor rural areas in the Democratic Republic of the Congo, Ethiopia, Madagascar, Mozambique, Nigeria and Tanzania.